Howard Burke was the author of this special foldout map included in a 1940 LA Examiner newspaper. Even before US entry into World War II, this map anticipates the rise of the USSR as a superpower and the post-war Cold War. Note the use of the orthographic projection that would come to be associated with Edes Harrison’s maps of the period. This map was included as a supplement in Fortune magazine at the height of World War II and uses Edes Harrison’s preferred orthographic projection. Text on this map explicitly argues for the value of the orthographic projection over the Mercator when trying to visualize and strategize for a global war. “Richard Edes Harrison’s innovative maps of the 1940s are critical to the history of American cartography. His techniques defied convention and created a new standard for the look and shape of the world on a map. Harrison designed the maps to be both visually appealing and politically charged, reflecting the urgency of the war while also maintaining the elegant artistic dimension.” (Susan Schulten, “R E Harrison and the Challenge to American Cartography,” Imago Mundi 50 (1998): 174-188). Ernest Dudley Chase was the creator of travel diaries, greeting cards, and 22 maps. 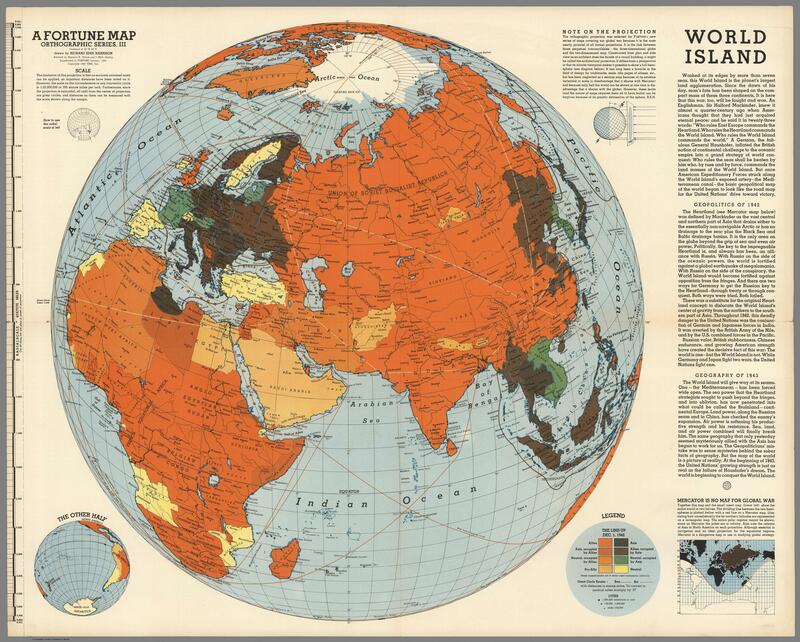 This pictorial map has a hopeful message of the world united in peace, created as World War II was drawing to a close. It bears an optimistic and humanistic message of social progress through technological advancement and can be seen as a counterpoint to the maps of the period designed to represent a world at war. Messages of peace abound, including a drawing, center top, of flags of different nations with a rainbow and the slogan “Bound by a code of international friendship, law and order, united we stand — divided we fall.” In addition to the more historically oriented illustrations are allegorical drawings such as one of several men on a globe-form sailboat emblazoned “World Unity,” with the caption “We are all in the same boat.” The artist also illustrates ideas for new technologies such as a missile captioned “Rocket Mail of the future.” The map is executed on Mercator’s projection with a decorative cartouche. This general interest and advertising map was produced and distributed by the Kressich Company in 1948. 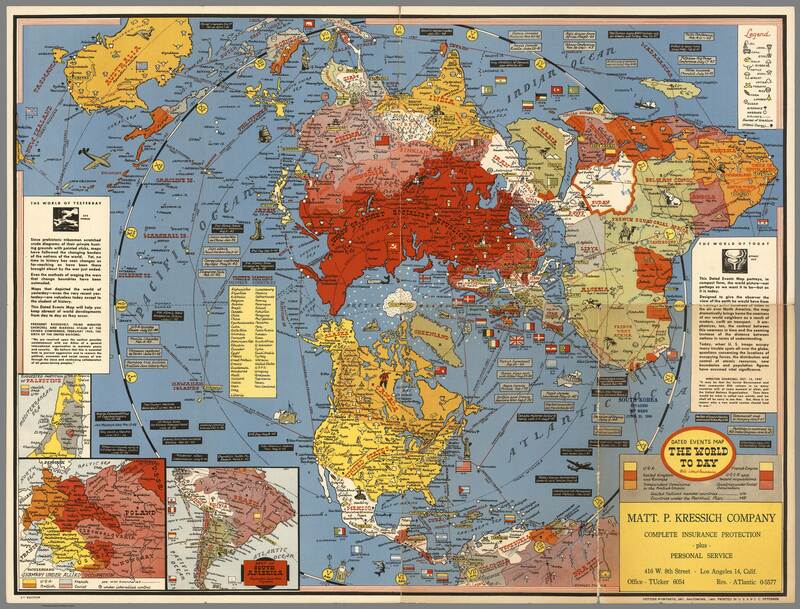 The text on the map contrasts the World of Yesterday (sea power) with World of Today (Atomic Age). The map utilizes the polar azimuthal projection which had become much more popular in the age of air travel. This map by John Bartholomew is the frontispiece from the first volume of the Times World Atlas. 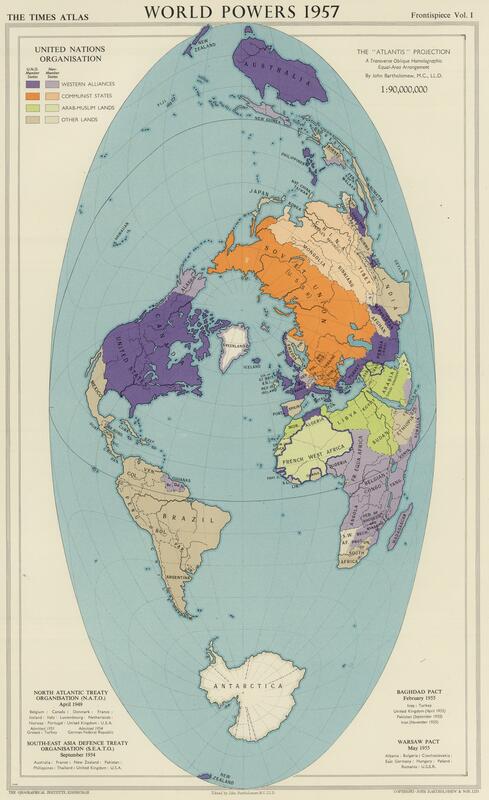 It shows alignment of world into western, communist, and Arab-Muslim alliances on an unusual “Atlantis” projection. This is one of two Associated Press maps about Vietnam on display. 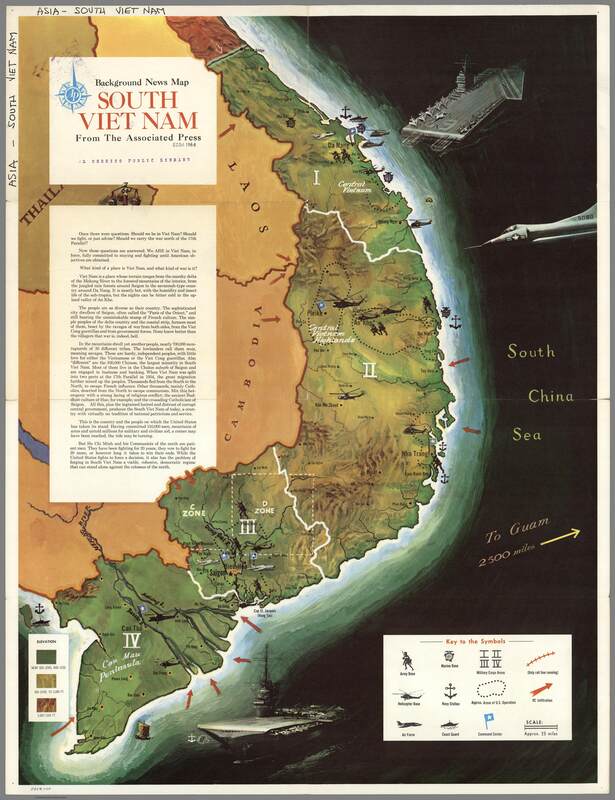 This map orients American readers to the situation in Vietnam in a way that is informative while incorporating some propaganda messages. The small map in the lower right is an important clue about the state of the insurgency with regard to control of South Vietnamese territory. 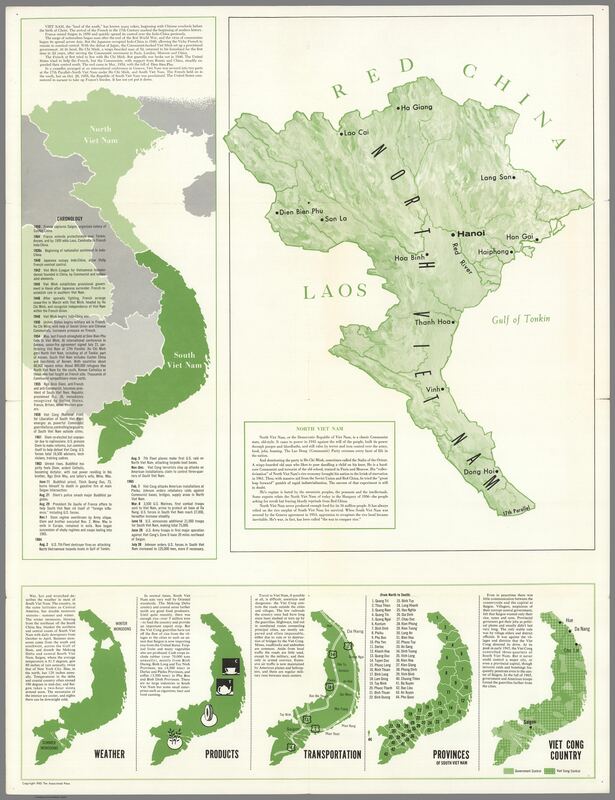 This Associated Press Background News Map was published in 1966 and provides a general overview of Vietnam’s territory and a brief background on US military involvement in the country. 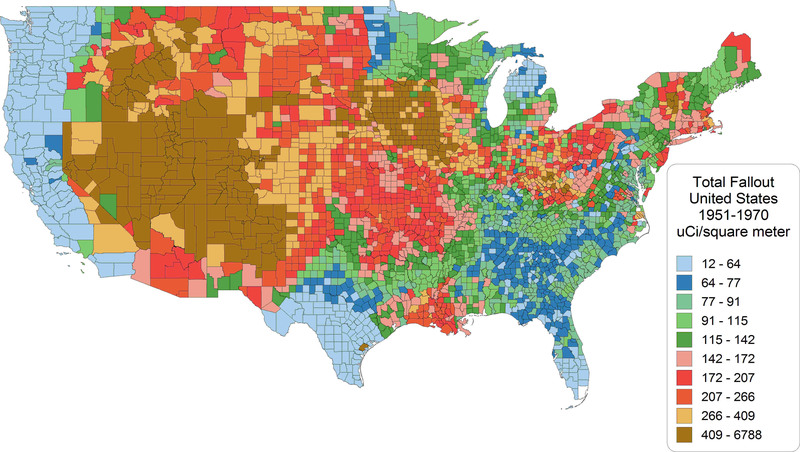 Contrast this map with the one produced one year earlier for style and content. This US County map shows fallout from the Nevada test site during a twenty year period. It is taken from Richard Miller’s U.S. Atlas of Nuclear Fallout 1951-1970: Volume I Abridged General Reader Edition. This detailed map was produced in Poland and depicts one scenario for an outbreak of nuclear conflict in Europe – in this case initiated by a hypothetical NATO nuclear attack on Poland and East Germany by American bombers and missiles originating in West Germany, Belgium and the Netherlands. 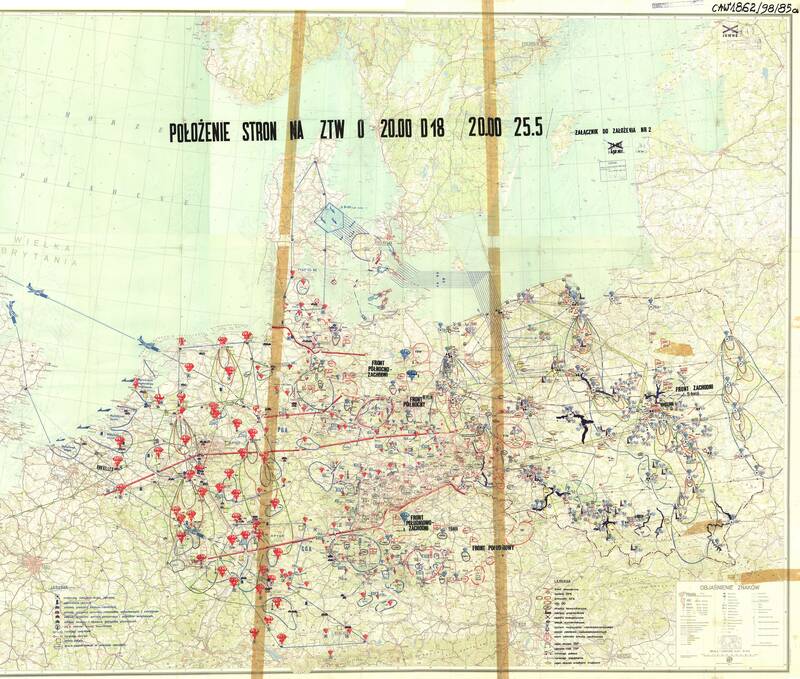 The map is one of many top secret Warsaw Pact documents passed to American military leaders by Ryszard Jerzy Kulinski, a Cold War spy for NATO. The plans predicted that NATO would launch a nuclear attack on the Vistula river valley in a first-strike scenario, which would prevent Soviet bloc commanders from sending reinforcements to East Germany to prevent a NATO invasion of that country. The plan expected that as many as two million Polish civilians would die in such a war and Poland would be completely destroyed. With options limited, a Soviet counter-strike against West Germany, Belgium, the Netherlands and Denmark would take place in an effort to slow an invasion.